My anger goes from 0 to 60. I know I’m screwing up my kids. I feel so guilty. I don’t understand why I keep yelling. I know I need to stop. My mind goes blank and I just give in when he starts to cry or yell at me. Do the statements above sound familiar? These are actual phrases from clients describing their parenting triggers or those moments where things our children say, do, feel, or experience awaken strong feelings within us such as powerlessness, sadness, anger, or fear. The strong emotions are seldom the problem; they actually carry insight into what we need to heal and where we need to grow. It’s our disproportionality strong reactions that leave us feeling guilty, regretful, and disconnected from ourselves and our children. When we effectively manage our triggers we stay connected to our children during high-stress moments, spend less time feeling guilty and questioning ourselves, feel confident we can handle situations instead of losing our patience, and avoid passing ineffective parenting patterns on to our children. 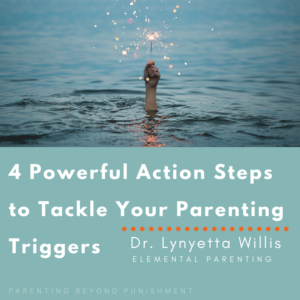 What can I do about my parenting triggers? Becoming aware of our triggers is one of the kindest things you can do for yourself and your child. Parenting triggers result from past experiences and feelings we never fully processed. If crying was seen as bad in your childhood home, your child crying may trigger your anger. Triggers do not always lead to anger. If anger was a fear tactic used towards you as a child, you may freeze or give in when your child becomes angry towards you. Awareness of your parenting triggers increases your power to respond and not overreact towards your children. Action Step: Gain trigger clarity. Make a list of parenting situations that lead you to overreact towards your child and answer the following: What happened right before your overreacted? Did your child say or do something? What emotion or thought surfaced when you were triggered? Self-care practices are the best strategy you can use to limit overreactions. Practice calming strategies, like deep breathing or visualization, before you enter into situations that previously triggered you. Most often, we tend to overreact when we feel fatigued, frustrated, famished, fidgety (anxious), fearful, forgotten (lonely) or what I call the 6 Fire Fuelers. Consistently engaging a small self-care or calming practice throughout your day can minimize the effects of the 6 Fire Fuelers; a consistent practice also increases the likelihood that you will remember the calming practice when you are triggered. Action Step: What is one calming strategy that you can practice regularly today? Set your phone every 4 hours to remind you. What is one small way you can care for yourself today? Write it in your calendar. Our triggers are fairly predictable. We may have more resources to deal with them on some days, but until they are healed, our triggers remain pretty standard. This is good news because we can plan for high-stress moments and put supports in place. For instance, if you find yourself repeatedly triggered when trying to leave the house in the morning, ask yourself, do I have too many morning plans? Can bookbags get packed or clothes ironed the night before? Action Step: Using the trigger list you wrote above, determine the situations and times of day you’re more vulnerable to feeling triggered. Before school? After school? During bedtime? Find ways to put less pressure on yourself and your child in those moments. Our children do not trigger us; the stories we tell ourselves about their behavior triggers us. Years ago, I realized that labeling my children’s behavior “good” or “bad” was turning me into an angry power struggler. Borrowing from the Buddhist tradition, when I challenged myself to view their behavior as “skillful” or “unskillful” and “effective” or “ineffective” I became a curious teacher. All behaviors seek to meet a need and our children’s needs are no different. They are not trying to make us mad or ruin our day. A simple shift in language can take us from forcing good behavior to teaching skillful and effective responses. Action Step: Revisit your trigger list. What stories are you telling yourself? How does viewing their behavior as unskillful or ineffective (vs bad) shift your thoughts and emotions? What is that moment calling you to teach them? Those of us who were raised through pain, blame, shame or avoidance, or what I call the Four Horseman mindset may find dealing with parenting triggers especially difficult. Similarly, those raised in homes without this mindset may still struggle when feelings of powerlessness or sadness are triggered. If identifying, understanding, and dealing with your triggers is challenging, consider talking to a professional or a close friend. You don’t have to go it alone!